Explore the many facets of the physician-patient relationship and the many issues that can impact your bedside manner. Judith Sands, RN, is a health care professional with expertise in patient safety and case management. She recently published Home Hospice Navigation: The Caregiver's Guide, which offers a wealth of information and resources to those who are caring for a loved-one at the end of their life. In this episode of Bedside Manners, Judith reflects on what the physician or PA can do to help ensure patient safety, care coordination and dignity at the end-of-life. 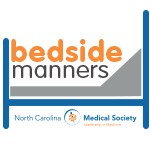 Dr. John Woodyear, a family physician in Troy, North Carolina, and Candace Nugent, one of his patients currently in recovery, discuss their doctor-patient relationship, the opioid epidemic and other related topics in this edition of Bedside Manners. Your host is Jared Weber, a UNC School of Media and Journalism student, and recipient of the North Carolina Medical Society's 2018 Medical Journalism internship award. The North Carolina Medical Society Foundation (NCMSF) has launched Project OBOT to help physicians and PAs treat opioid use disorder. Thanks to comprehensive care coordination throughout the community, patients who are part of Project OBOT are more likely to stick to their treatment plan. Franklin Walker is overseeing this innovative initiative for the NCMSF and explains how it works and why it's so important. You can learn more at projectobot.com. Meet Diana Dayal, a second-year medical student at the University of North Carolina School of Medicine in Chapel Hill. Diana has always been politically engaged, but as a medical student she feels even more passionate about health care advocacy on behalf of her future patients. Hear Diana discuss what she is involved in and why she thinks this type of activity is so important. Dr. Kinneil Coltman explores unconscious bias and what the research shows its impact is on health care and health outcomes. Learn how to uncover your unconscious bias and how it may be affecting your bedside manner. Dr. Clark Gaither aka 'Dr. Burnout' shares his own experience with being a burned out physician and how he recovered. He details how you can identify the signs and symptoms of burnout and steps you can take to transform from being burned out to finding new meaning in your career and life. Dr. Blake Fagan makes the case for Medication Assisted Treatment (MAT) as the way physicians may help those with opioid use disorder regain control of their lives and health. Find out more about MAT training at www.ncmedsoc.org.